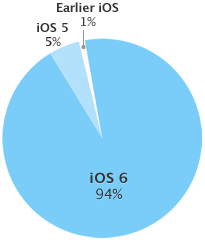 Apple published a nice chart of what iOS version people are using. As part of the WWDC keynote, Apple has also said they've sold 600 Million iOS devices. 1% of that is 6 Million. But people have broken them (which knock-on-wood I've not done yet), replaced by a new device (which I've done a LOT.) Lets say 2/3 of the devices that have been sold are still active. So 1% of that 400 Million actives is 4 Million who are using an iOS 4.x or older version. If they're like us, they each have an old device or two they keep around for testing apps...I've got an old iPod touch and a first generation iPad. What if that the majority of that 1% using old iOS versions is all the developers testing their apps on old iOS versions! We're going to require iOS 6 on the next update to our biggest app, FTP On The Go Pro.